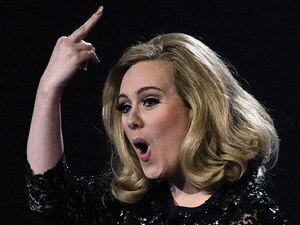 UNCOOL: ITV for destroying Adele’s Best Album speech! | Everything is cool. UNCOOL: ITV for destroying Adele’s Best Album speech! It’s an unwritten rule in speeches. You neeeeeeeeeever, but NEEEEEEEEEVER, interrupt someone during a speech of thanks!! Especially not Adele, cos’ she’ll give you the finger. Gwan gel! Doesn’t matter how many Grammys Adele won. Doesn’t matter how much money she’s made. Girls’ got a right to reply, otherwise these award ceremonies just stink to high heaven of money. Pshhhh, the Mobos were NOT like this. ← Playing it Straight UPDATE: Danny to WIN!!! !